At today’s sitting of the Riigikogu, the Governor of the Bank of Estonia Ardo Hansson presented the central bank’s annual report for 2017. In his report, Hansson focused on the euro area economy, and the Estonian economy and budgetary policy. He also spoke about other activities of the Bank of Estonia. In the overview, Hansson pointed out that the economic development of the euro area had been better than expected. The economic growth was about 2.5 per cent last year. That was supported by the improved external demand and the sense of security in the euro area. The economic growth was broad-based, and that was the case in all 19 member states. Estonia exceeded nearly all post-crisis years in terms of economic growth last year. The Governor of the central bank said that the five-per cent economic growth was a result of several factors. First he mentioned the good welfare of our immediate neighbours that had grown the export volume. Second, in Hansson’s words, the income of the people, and therefore also consumption, has grown. Thirdly, he pointed out that the economic growth had been affected by the lenient monetary policy, and for a short term also by the more extensive use of the European Union money. However, the Bank of Estonia has concluded on the basis of its studies that the current situation is temporary, and the economic growth is likely to slow down in the coming years. The deepening labour shortage, vigorous salary growth and increase in consumer prices show that the economic growth of Estonia is mainly driven by the growth in demand, and not in productivity. Hansson welcomed the commitment to draw up a balanced budget that would be in nominal surplus that had been made in the drafting of the state budget strategy. 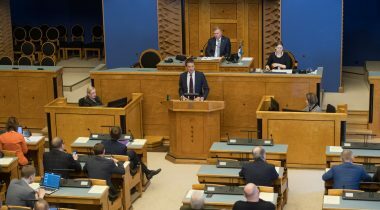 He said that, in the future, less financial aid from the European Union would be available, and that it was in politicians’ power to ensure as smooth a transition as possible for Estonia. “I have also said several times earlier that, in a time of rapid growth, it is not reasonable to spend more than we earn; that possibility could be reserved for worse times,” the Governor of the Bank of Estonia emphasised. It is the task of the Bank of Estonia to maintain the stability of the Estonian financial system, and the banks operating in Estonia are strong, and risks are small, Hansson said. However, a possible steep fall in real estate prices in the Nordic countries may be a threat, as our banks are Nordic banks. Another possible risk, in his words, is the favourable ground for a real estate bubble created by the growing sense of security and salaries, and low interest rates. As the third risk, he mentioned the great demand in the real estate market which may concentrate labour force and capital to the construction sector temporarily for a couple of years. Hansson confirmed that the Bank of Estonia was following the situation and was ready to tighten the measures to manage risks if need be. The central bank had allocated a quarter, that is, 1.1 million euro from last year’s profit to the state budget, and the rest to the central bank’s reserves. The Bank of Estonia considers it reasonable to collect reserves also at the Government level. During the debate, Enn Meri took the floor on behalf of the Free Party Faction and pointed out that labour shortage was a great problem. He said that the education system had to be reviewed and brought into conformity with the needs of the labour market. 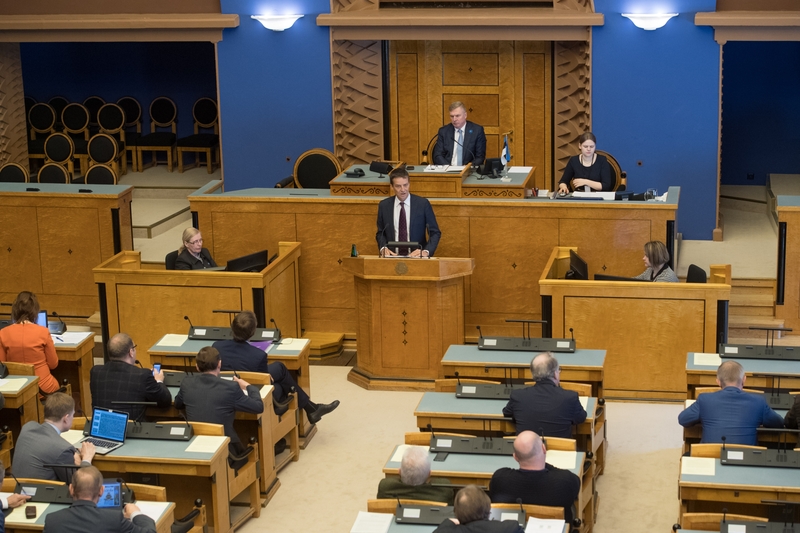 The Bill on Amendments to the Estonian Defence Forces Organisation Act and Amendments to Other Acts arising therefrom (594 SE), initiated by the Government, was sent to the third reading. The Bill will organise the structure of the Defence Forces, and the activities of the Defence Forces will be made more flexible in order to allow for quicker response to new tasks. In the future, the structure of the Defence Forces, and the names of the structural units and the functions thereof will be established at the level of the statutes similarly to other government authorities. After the entry into force of the amendments, the functions and the rights and obligations of the Defence Forces will remain regulated at the level of Act. The current regulation does not allow for the structure of the Defence Forces to be changed operatively and flexibly. The obligation of the Government to establish the standard sizes and structure of military units, the names of their subunits and their categorisation according to armed services and branches, as well as the division of military units into high readiness units, rapid reaction units and reaction units, will be omitted from the Act. This will give the Commander of the Defence Forces a larger activity space in the organisation of the performance of the functions of the military units. The official titles of the commanders of the structural units of the Defence Forces will also be omitted from the Military Service Act. Instead, there will be a reference to the effect that there are positions that are appointed by the Government or the minister responsible for the area. In the future, the Act will concern only the appointment of the Commander of the Defence Forces. According to a proposed amendment to the statutes of the Defence Forces, no new positions appointed by the Government will be established, but the Government will be reserved the possibility to provide them. The Minister of Defence will appoint the Deputy Commander of the Defence Forces, the Chief of Staff of the Estonian Defence Forces, the Commander of the Navy, the Commander of the Air Force, the Commander of the Special Operations Command, the Commander of the Military Intelligence Centre, and the Commander of the Support Command. The draft statutes are intended to give the Minister of Defence a new right to appoint the Commander of the Cyber Command and the Commander of the Military Police. The Bill will provide for the possibility to involve reservists in international military operations in order to increase the capacity of the Defence Forces to respond more quickly to immediate threats. The Bill will also provide for the punishments for misdemeanour for the use of an unmanned vehicle in the military zone of the Defence Forces, and for photographing or recording without prior permission. The objects of the Defence Forces where the recording or forwarding pictures or images is prohibited are marked with prohibition signs, as a general rule, or a reminder is given upon the entry into the object. The Bill will also amend the rules for sending active servicemen on long-term secondments. Seven motions to amend the Bill were submitted during the second reading. A major motion to amend will amend § 12 “Organisation of Defence Forces” of the Estonian Defence Forces Organisation Act by adding four new subsections that will specify the organisation of the Defence Forces. Under the amendment, task units may also be formed in the Defence Forces in addition to the units specified in the statutes. They can be formed on the basis of both regular structural units and wartime units. The Commander of the Defence Forces will establish the procedure for the formation of the task units of the Defence Forces.